While a downtown business call to police for help went unanswered, our police force seemed to just continue dividing its time between chasing drivers traveling on East Charleston Boulevard — probably on their way to work — and having a free soda at the 7-Eleven on Charleston and 10th Street. The call to 311 was made on Friday, September 28 at 8:40 a.m. to report two homeless people using the parking lot as a toilet while the homeless male’s intent was to attack the Las Vegas businessman reporting the nasty and smelly incident. Four hours later, at 12:40 p.m., the police had still not arrived, but in the meantime two patrol cars — not one, but two patrol cars — were used to ticket a one-man occupant of a car while a motorcycle officer was inside the corner 7-Eleven getting a soda compliments of the store employee. 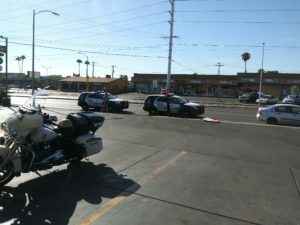 Since early that morning, the motorcycle units had invaded the area of East Charleston Boulevard between Las Vegas Boulevard and Maryland Parkway where an eighteen-wheeler was stopped by four — yes, four — motorcycle police officers. It seems like giving tickets to drivers on their way to work produce more revenue than responding to a business call requesting assistance for a businessman who also helps contribute to the city revenues by paying for a business license to operate a legitimate business. Three hours after the original call, the business-owner called the 311 non- emergency number with the intention of canceling the early call, and after the telephone rang for ten minutes, the operator answered and told the caller she was placing him on hold because she had to answer a 911 call and never got back on the line to help the 311 caller. The possibility may exist that because the call originated from the offices of the Las Vegas Tribune, the call for help was ignored by the call-taker and was never dispatched to the officers in the field. It is normal for the police department to discriminate against this newspaper since the era of former Sheriff Douglas Gillespie, AKA Doug Gillespie, for not supporting him in a Sheriff race, just as the newspaper did not support Lombardo either. Sheriff Joe Lombardo may be following the same pattern as his friend and coworker, former Sheriff Gillespie, in discriminating against the Las Vegas Tribune for not supporting either one of them for that office. It is public knowledge that the Las Vegas Metropolitan Police Department discriminates against the Las Vegas Tribune; when someone from the newspaper calls the Public Information Office requesting information or asking for comments, they always say they’ll call back, but they never do. A local business connected to the owners of the newspaper has been burglarized three times in less than one year, two times in a single weekend and the police have not lifted a finger to solve the crime, even though two of the perpetrators are known to the police for allegedly being snitches for some officers on the streets, and the other two are in custody for other crimes, but the police and the district attorney refuse to add those charges. The newspaper has its own way to confirm any information it requests and no longer needs to call the PIO to verify anything according to the newspaper’s General Manager, Perly Viasmensky.